Once you bring your family in Saudi visit visa, Now you will have only one tension of extending visit visa. Here you have two situations, For how many days your visit visa is issued. Now expatriates can extend visit visa online throughout year, even on public holidays. - If your visit visa is issued for 30 days, You can extend it for 5 times ie,. Every 30 days you should extend it, By this you can let your family stay with you for 180 days only. - If your family visit visa is stamped for 90 days, You can extend it for 90 days more. ie,. Just one week before of your visa expiry date, you can request to extend it, By this you can let your family to stay with you for 180 days only. 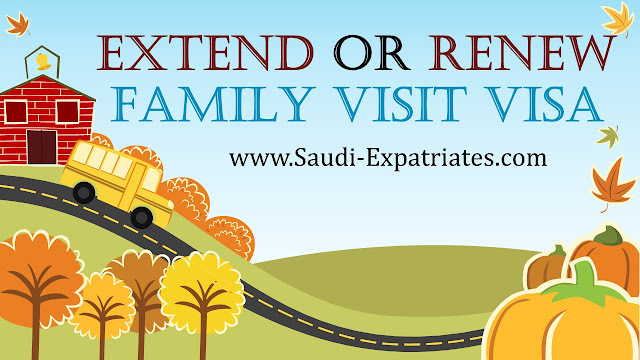 For extending family visit visa in Saudi Arabia, You should apply within one week of your visit visa expiry date. Expatriates have two options here first one is Manually and the other one is Online. This article will describe both of these ways. - For extending visit visa online you should have MOI Abshir account, if you dont have creat one (MOI Registration). - Pay 100SR fee online through your bank account, for the extension of family visit visa. - Login to your MOI Abshir account, Goto "E-Services" section, Click on "Passports". - Select "Extend Visit Visa" from drop down list and Click on "proceed" button. - Click on "Confirm to Extend Visit Visa", Now you can see a message of "successfully extended visit visa". Original and Copy of Passport (Including visa page), Original and Copy of Iqama (Visit visa Sponsor ), Passport size white Background Photo, Filled Passport Form, 100SR Fee (Pay Online through your bank account), Online Token(For Dammam & Khobar residents). Visit Jawazat office, You can take help in paying fee online and filling Passport form from the people who sitting there on a charge of 20SR. Submit all documents at the counter and get your family visit visa extension, Check whether it is final extension or not. If your family overstay even a single day a fine of 25000SR will be charged on the iqama holder of visit visa. So it is better to departure them before 4 or 5 days of expiry date. Really informative forum and Allah bless you for your good deeds. I got visa on 3/15/2015 for my parent with duration of 30 days but one of my colleague is saying that now you can renew it only twice. Is there any such policy or restriction regarding visa renewal for different people. Please reply so that I can plan accordingly. Thanks in advance. Mr. Shamid, It seems to be true as many expats experienced this, For 3 months they got one extension of 3 months and for one month they got ONLY one extension of 1 month. I haven't any bank account how can I pay visit visa fee? You can make one, Its not that much difficult, Fill online account opening form from any bank, Then submit printed copy with iqama, passport and letter from sponsor. Can we extend our Visa Before One month of Expiry Date..
You can, if it is possible, But it is not possible, As they can extend only whether one week or 3 days before. Yes you can do online, But they are accepting one week before of its expire date.